First, a doctor told Marsha Badagliacca that she was going to die. It was the least likely thing Badagliacca expected to hear. She was 61 and had never smoked. Now, she had cancerous tumors in both lungs. And they were at Stage IV, the most advanced in extent or distribution, that doctor said. Hearing a physician deny her any future “was the most devastating medical experience,” Badagliacca said. Treating cancer has long been a carefully negotiated balance between good and bad. Badagliacca’s tumors were re-evaluated at Stanford, not as Stage IV, but as an early stage of an unusual, slow-growing lung cancer that often appears in non-smokers, especially women. Surgery was not possible because it would have left Badagliacca with too little breathing capacity. Radiation was her next best hope. While radiation is good to destroy cancer cells, it kills healthy cells, too. Adler’s quest, then, was to build a delivery system that could get a lethal dose of radiation to the cancer without spillover and to get the radiation to wherever the tumor was at any given moment, regardless of body movement. More than 400,000 Americans live with lung cancer, with another 200,000 newly diagnosed each year. More than 160,000 people die each year from the disease. Ninety percent of new lung cancer cases are attributable to smoking. Non-smokers like Badagliacca, who grew up in homes where people smoked, are at 20 to 30 percent increased risk to develop the disease. Unfortunately, the survival rate for lung cancer is lower than most other cancers, driven in large part by its lack of symptoms until the disease reaches its later stages. 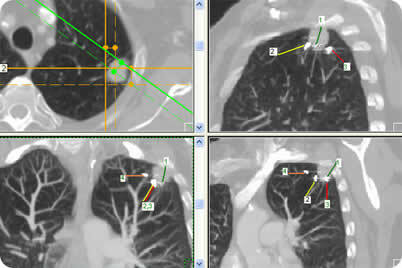 Only 16 percent of lung cancer tumors are found while still localized. About one in six people with the disease die within one year of diagnosis. Those numbers drive the work of physicians such as Billy Loo, MD, PhD, Badagliacca’s physician at Stanford and leader of the Hospital’s Thoracic Radiation Oncology Program. Stanford has been at the forefront of developments in radiosurgery―radiation focused with surgical precision, combined with advances in imaging systems to see cancer and track the radiation delivery. 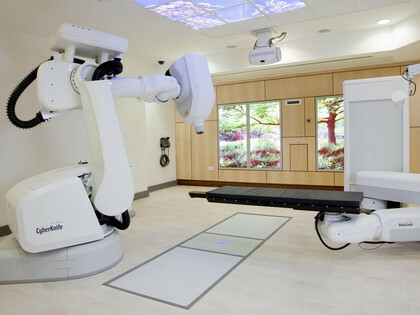 The CyberKnife, Loo said, is a leading edge radiosurgery player to treat difficult cancers such as Badagliacca’s. Its methodology, which Adler first prototyped in 1994, delivers radiation in highly focused beams that keep the radiation away from healthy tissue. Keeping the radiation under tight control allows physicians to deliver a higher dose of radiation with each treatment. That translates into fewer treatments, which translates into a patient being able to tolerate almost double the total amount of radiation in conventional treatments. The increased intensity of individual doses in the CyberKnife increases the DNA damage done to the cancer cells, which increases the odds they will not be able to reproduce and grow. 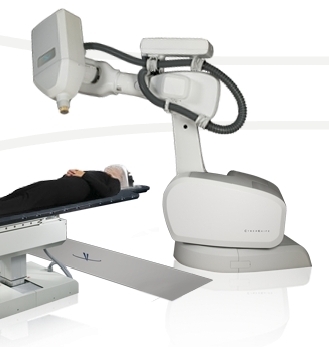 The CyberKnife’s movements achieve their precision through sophisticated robotic engineering, but knowing where to go is the first step. “The key to radiosurgery is seeing the tumor, focusing the radiation on the target and verifying that we are hitting that target,” Loo said. Stanford physicians can build a four dimensional image of a patient by integrating information from a CT scan’s view of the body’s anatomy with the PET scan’s view of that anatomy’s biochemical behavior. The final image is a map of a tumor in time and space, a crucial guide for treatment. Lung cancer is the deadliest cancer. It takes more lives than breast, prostate and colon cancer combined. So how did these women end up cancer-free?" "When you first hear, 'You have cancer,' you don't expect to get over it like I did," said Frances Nirich, lung cancer survivor. Nirich is one of about 55,000 people who are told they're too sick, too old or too weak for surgery. She enrolled in a study to see if the cyber-knife can help those who can't go under a real knife. "While you're radiating a tumor that moves, you can hit it with millimeter precision," said Dr. Brian Collins, radiation oncologist at Georgetown University. The device shoots radiation into the tumor without harming the rest of the lungs, even as the patient breathes in and out. A five-year study found cyber-knife destroyed 95 percent of tumors. The three-year survival rate: 80 percent. It's a big difference from traditional radiation, which destroys 30 percent of tumors and carries only a 30 percent survival rate. Lung cancer patient Jennifer Hoppock didn't want major surgery. "We're now using smaller, keyhole incisions and telescopes with long instruments," Dr. Michael Smith, thoracic surgeon, St. Joseph's Hospital. Instead of an eight-inch incision between the ribs, surgeons make a few inch-long incisions and use a camera to find the tumor. "I went back to work after three weeks," said Hoppock. Two lung cancer patients-turned-survivors thanks to technology that's providing new options. The cyberknife and video-assisted thoracic surgery--or VATS for short - are available at Swedish Medical Center. 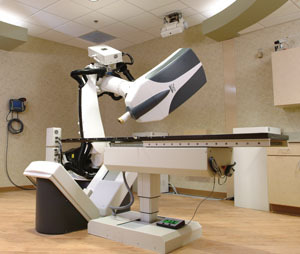 The VATS procedure is also performed through the Seattle Cancer Care Alliance.